First of all, things always seem to go awry when I'm tired and the past two nights I've been shorted of neccessary sleep! So needless to say, coffee has been my best friend and constant companion. 1) You all know I love to cook. Like REALLY love it! As every cook knows, you win some you lose some, but it's always fun to play with new things. Well, on Tuesday I made a pumpkin pie. THIS is not a new venture for me. Chris loves them so my kitchen has produces several of these festive pies. 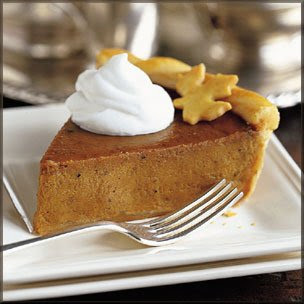 I baked my pumpkin pie the exact same way I always have, yet somehow, when it came time to eat this delicious dessert, the center wasn't cooked all the way. How does that even happen??? I was super dissappointed until my sweet husband said something like, "Did Julia Childs get it perfect every time?". I couldn't help but laugh at how sweet he was for trying to make me feel better. Well, it turns out there may be something wrong with our oven temperature. Man I would be relieved if that was the case! Someone's coming to look at it soon. 2) After work yesterday I made a quick run to Aveda to grab a few products I was out of. In my unconscious hurried state, I walked into to the store and was instantly greeted by four employees (it seemed to be a slow day). And even more strange, some teen sales guy walks up to me in an "I don't quite understand personal space" fashion and shakes my hand and introduces himself...um, okay. Not trying to be rude, but I happen to know exactly what I need and exactly where to go, so I go about my business. As accustomed in Aveda I was offered a cup of tea. After my initial "No, thank you" the guy insisted he make me some iced tea. So I oblige, and even though I was checked out by the time he made it, I graciously accepted my tea and decided to enjoy it while I browsed for a minute (I couldn't take it because it was in a mug). You should know that I know every product in the store, and love them all, so I really wasn't looking out of interest. However, this guy thought it neccesary to give me a ten minute introduction to their essential oils, all the while adding that he just bought some creepy giant hand that also holds 5 candles in the fingers and that it's "totally sick". Seriously, was he mistaking me for someone else? Confused and finally finished with my tea, I gave him my empty mug and made a slow jog for the door! All is well because Grey's Anatomy starts tonight! I am totally a fareweather fan, but I watched the season finale and am so excited to see the premier of the new season! Wow, talk about a long, random post! Apparently being exhausted makes me incredibly long winded! Have a great day! Haha, me too! Especially with strange, overly enthusiastic young boys who try to force me to relax. Definitely not my typical experience at Aveda!